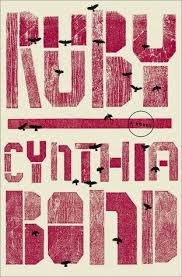 What did I think of Ruby by Cynthia Bond? I immediately enjoyed Cynthia Bond's style of writing. She captured me right from the start. Visually stunning in parts, an amazing weave of beauty and pain, and a sad story that could have weighed the book down, but is sprinkled with enough hope and compassion that the reader is pulled in for more. For the most part, the story takes place in a small Texas town named Liberty, where our characters struggle to exist in the racial inequality of the 1950's. Funny name for a town that is anything but Liberty. After years of violent abuse, Ruby finally escapes her small, gossipy, rural town surroundings for New York, the place her mother disappeared to years before, only to be summoned back years later to get sucked back into what everyone surely thinks is her legacy. She quickly transforms from sophisticated to crazy, as she deals with the guilt and the memories of her sordid past. In walks Ephram, who has loved Ruby Bell from the moment he saw those pigtails she wore as a child. He sees beyond the dirt and crazy; he knows her soul. It is his compassion that becomes the root of Ruby's salvation as the whole town tries to destroy her. The story is built with layers, characters and their connections, until finally halfway through I had the "aha" moment. Things started fitting together, and then it was OMG! The ending? Well, I liked it and I didn't like it. I liked the way it left so many possibilities, and I could imagine what I wanted. BUT, I wanted to have a finale, and I was left with an opening. I have since read that Cynthia Bond had trimmed down Ruby for this first publication, but her intent is to have a trilogy and she's shopping around. I hope she finds that publisher because I definitely want more. Open the pages of Ruby and meet Ma Tante, who can conjure some powerful black magic with her jars filled with who-knows-what; the Reverend Jennings who preaches in the shadows of the piney woods late at night; Celia Jennings, whose goal in life is to be Church Mother and who can bake up the best Angel food cake this side of Texas; and of course the other men and women of Liberty, who make up an unforgettable town in the wake of lynchings and dark spirits, superstitions and religion. I've heard other good things about this novel too. Good to get your take on it. thanks. Sounds interesting.